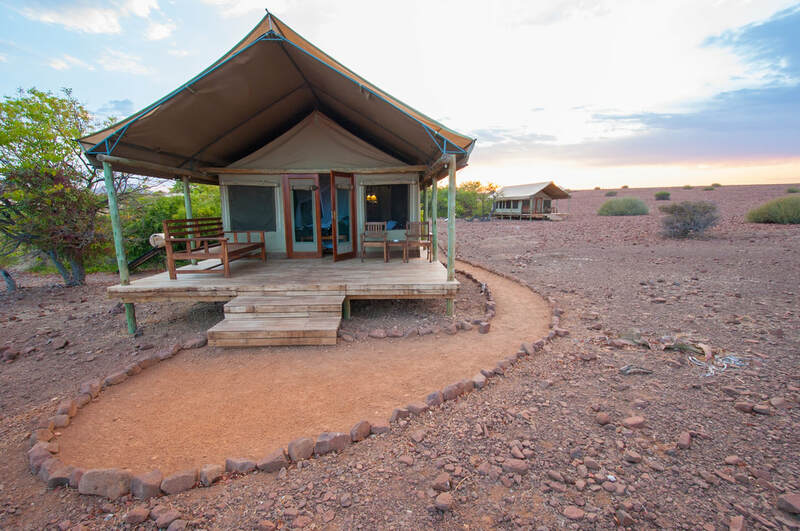 The spectacular Desert Rhino Camp. 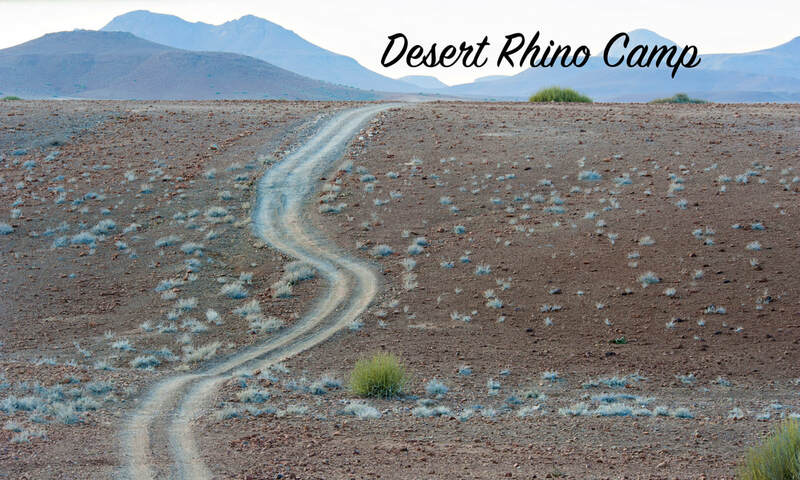 If you plan on coming to Namibia, Desert Rhino Camp must be one of the places you experience. 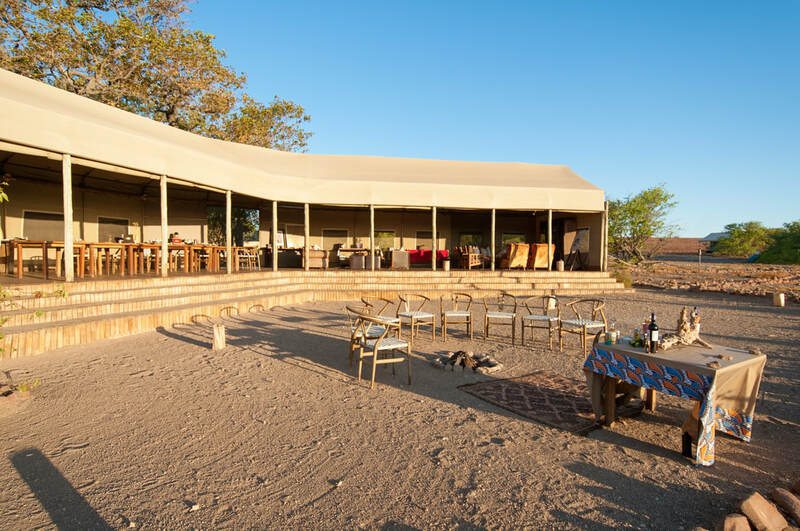 Our planning of this Namibia Safari trip revolved around getting to and staying at Desert Rhino Camp. 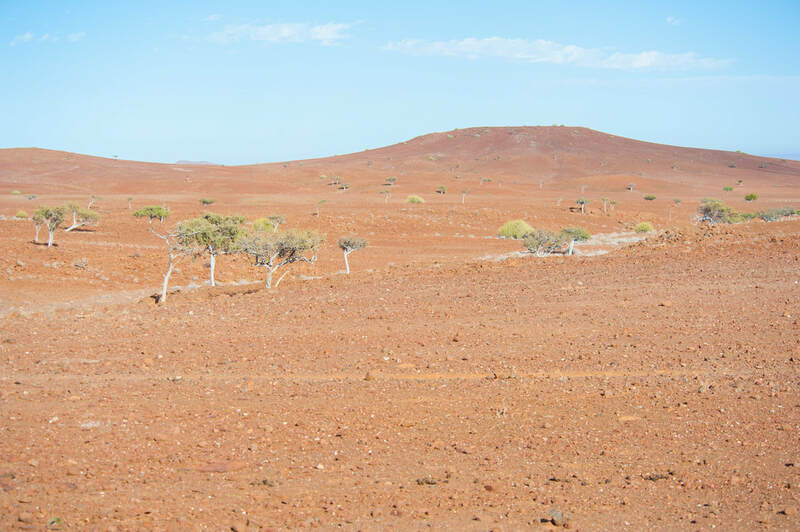 My whole itinerary changed after I spoke with an expert on Namibia, Chris Liebenburg, with Piper and Heath. 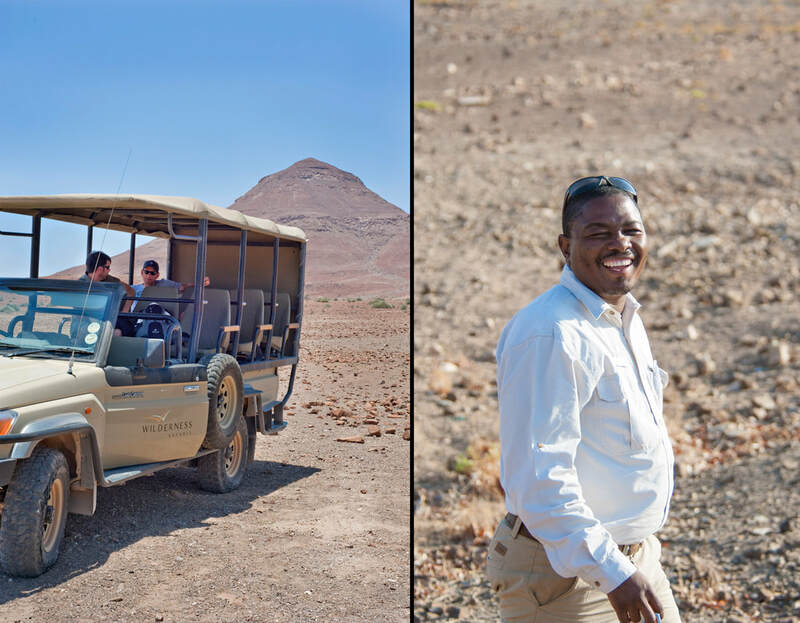 He reminded me that traveling to Namibia shouldn't be about the lodges I chose to stay at (I was choosing lodges based on how beautiful I thought they looked on their websites) but the experiences I couldn't get anywhere else in the world. Where else was I going to get the chance to track rhino on foot? ​This is where that possibility was going to happen. 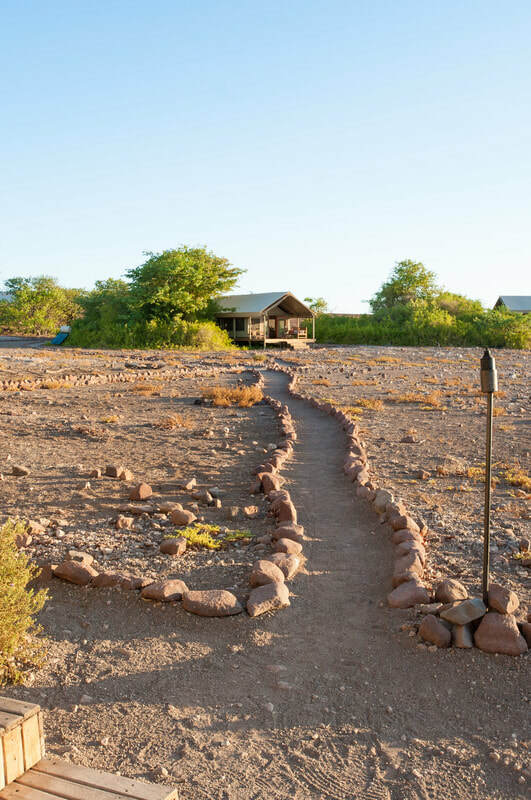 Rhino Camp is a journey in and of itself just to get to. 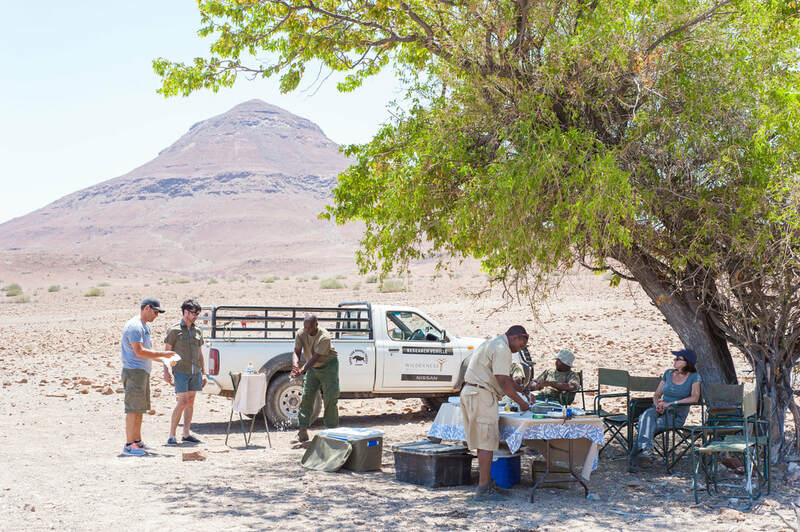 After driving for 6 hours from Anderssons Camp to our meeting point at the entrance to the Palmwag Concession in Damaraland where we were meet by a guide who drove us an additional 2 hours to what would be the highlight of our trip, Desert Rhino Camp. 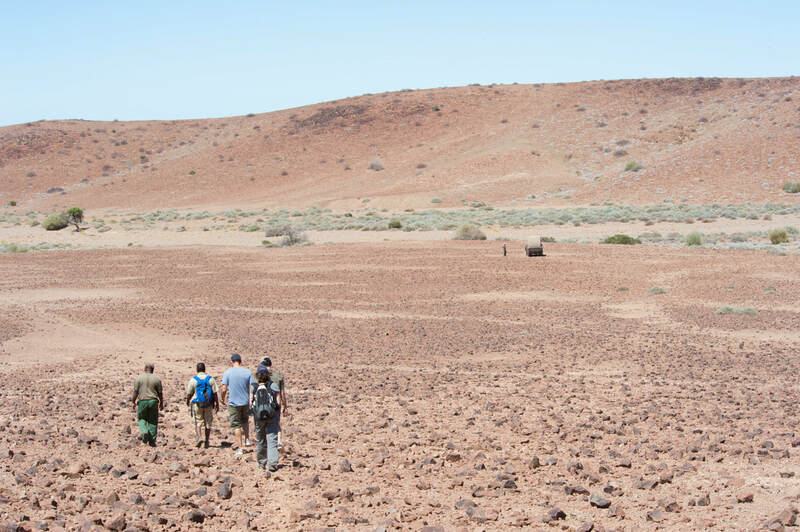 This area has the largest free-roaming Black Rhino population in Africa and a landscape that gives you a sense of what it would be like to roam on Mars. After a short rest and refusing an evening game drive, we were told "too bad, you're going on a little surprise drive this evening." Okay, when you put it that way. After meeting our new friends Marc and Crystal who are French Travel Agents doing "site inspections" (my new dream job by the way) we had cocktails around the campfire and speculated what our evening surprise might be. 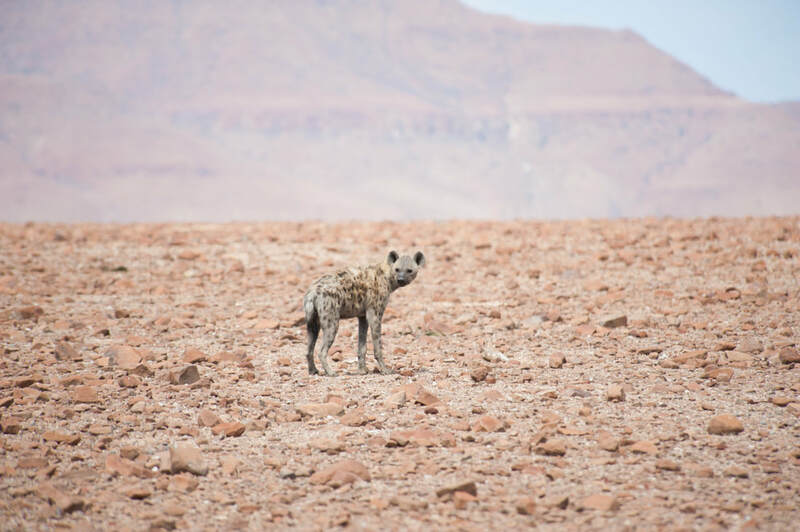 I thought I overheard that we may be in search of a hyena den. But no, something much more beautiful awaited us. 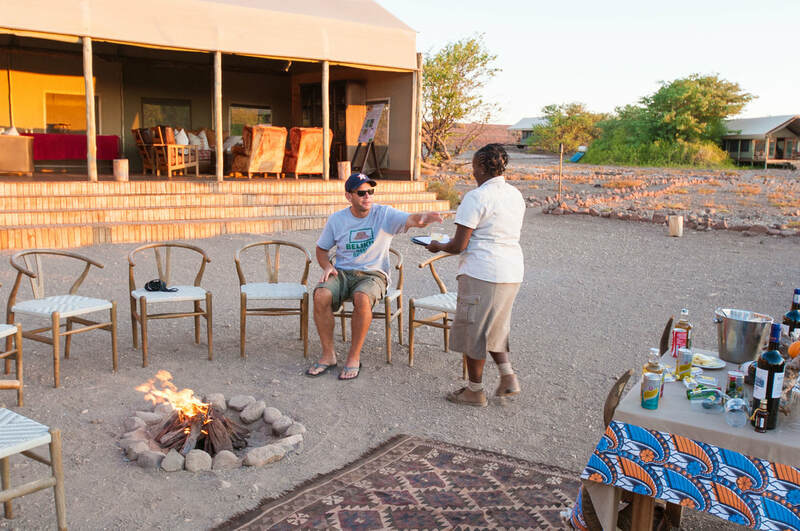 We drove a short distance to where the rest of the camp guests were already waiting for us to join them for a bush cocktail party and dinner under the stars. 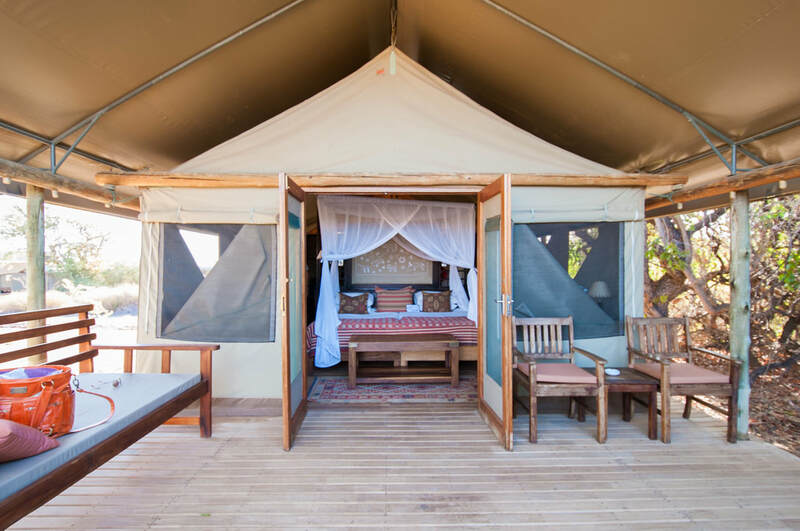 Imagine the most ridiculously romantic set up from the TV show The Bachelor, where there are dozens of torches and lanterns and a giant camp fire lighting the evening sky. We were greeted by the entire staff singing welcome songs and serving cocktails on platters. 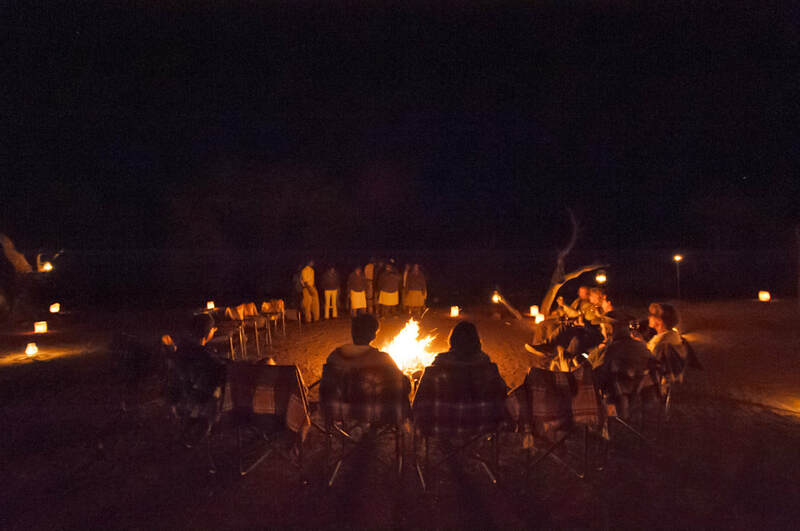 ​It was the perfect ending to a very long journey. 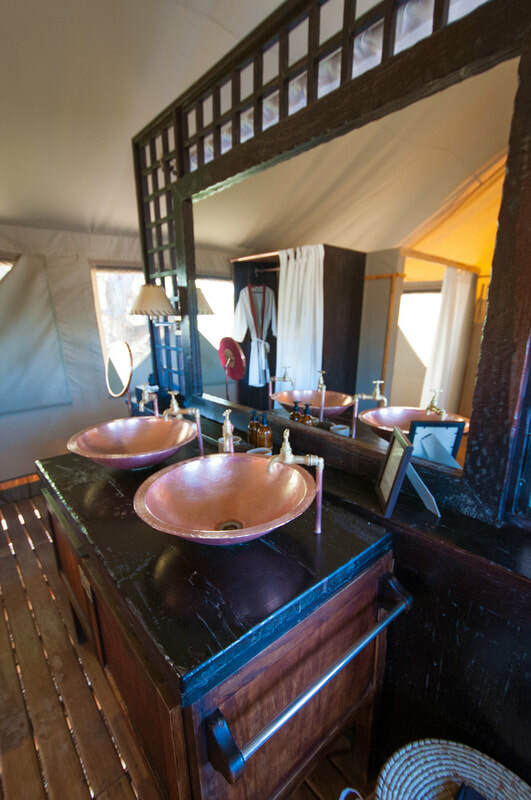 Rhino Camp has only 8 canvas tents and each one has gorgeous views of the desert with luxury amenities. We had plenty of conversations about the logistics of getting such nice things and fresh food to such a remote location. We were fortunate enough to have the best, most knowledgeable, funny guide, Bons, or as he liked to call himself, "The Chief". For two full days, he shared information about the importance of tourism and conservation in the national parks and the horrible problem of poaching and how it affects all of us. It's amazing how quickly you can come to love someone. The enthusiasm, knowledge, and humor Bons shared with us. 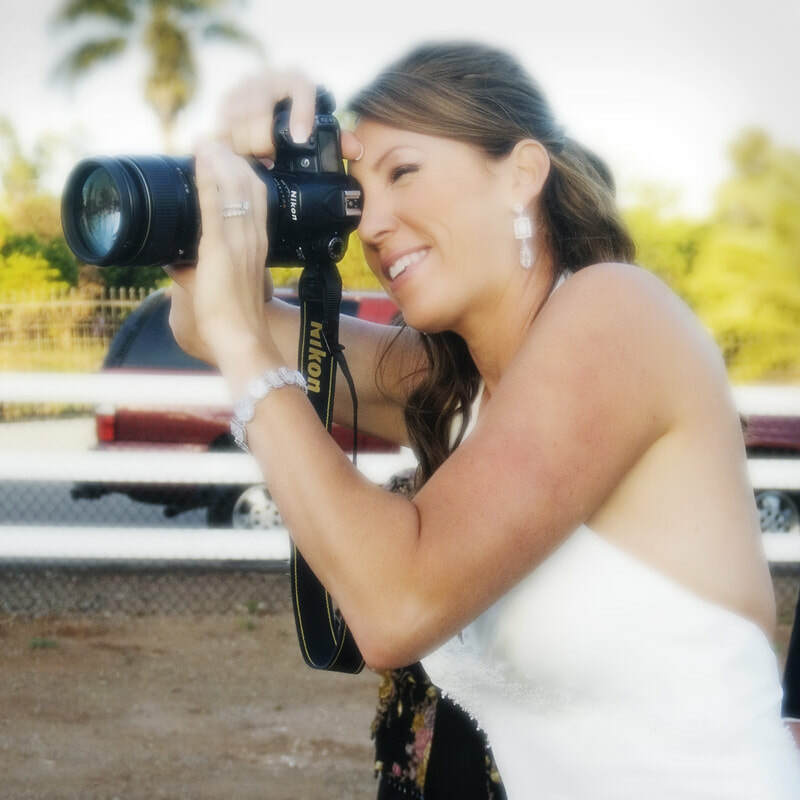 He left an indelible impression on my mind and my heart. 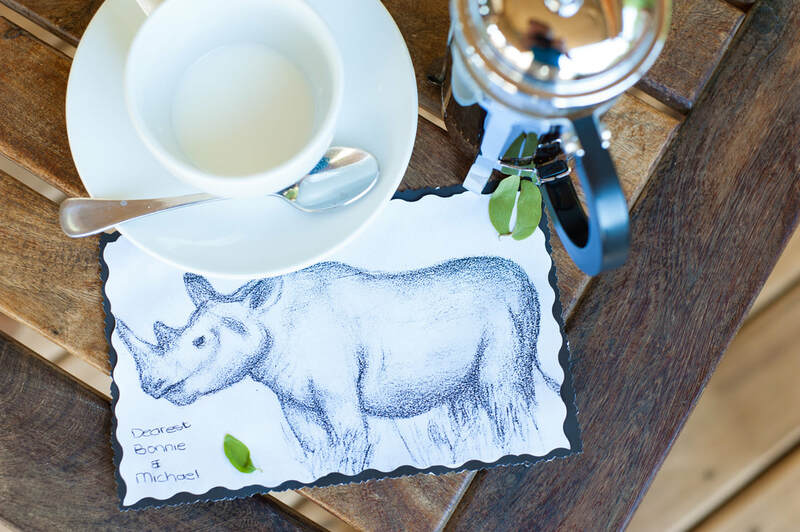 ​Check out Save The Rhino Trust for more information on conservation. Our first sighting of rhinos in the Palmwag was quite exciting. Bons had contact with 3 trackers who's job it is to keep a watchful eye on the rhinos in the park from a safe distance. They track and record their movement and activities, and it's hoped that their presence may deter any would be poachers. 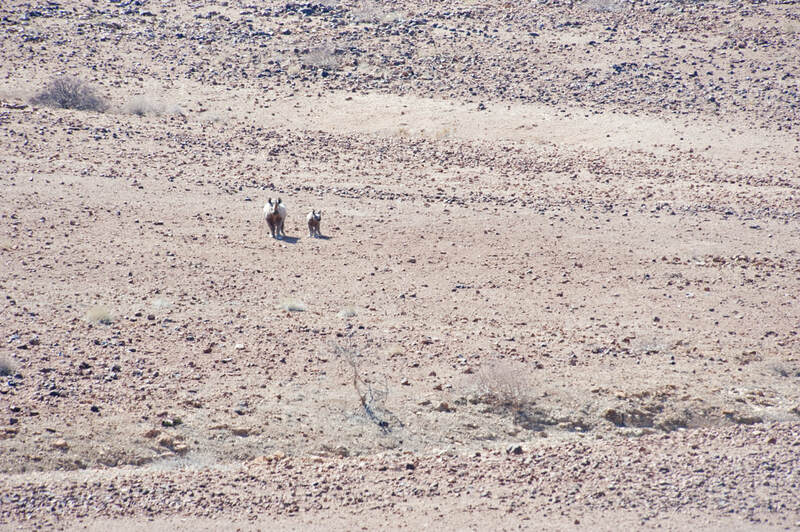 We met up with them and followed them up and over a mountain, where they believed a female and her calf may soon be approaching. 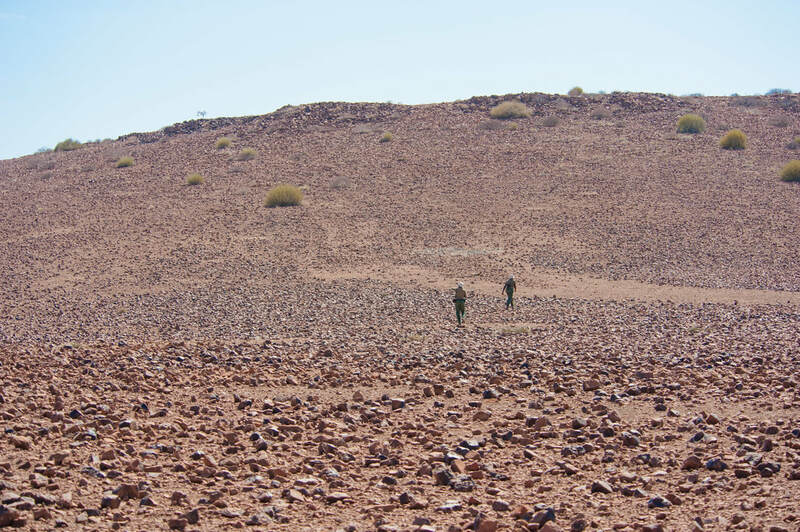 After a 40 minute hike over a landscape, I imagine Mars to look like, we found them. Trotting towards us in the distance. We were told to remain still and don't speak. Even though we were uphill and upwind, she still knew we were there and quickly turned in the opposite direction and ran off with her calf. 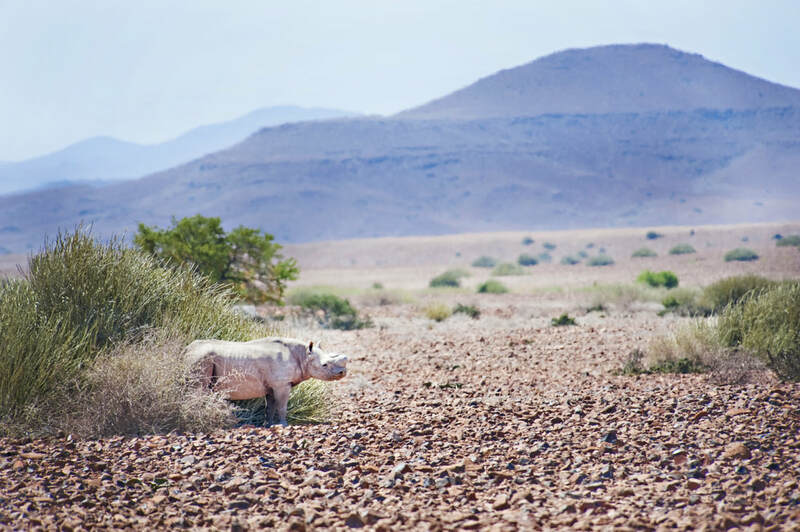 The animals and especially the rhino here are much different than those in Etosha which is essentially a giant wild animal park. The animals there are accustomed to seeing people in their cars and won't turn and run when you're pulling up to their waterholes. 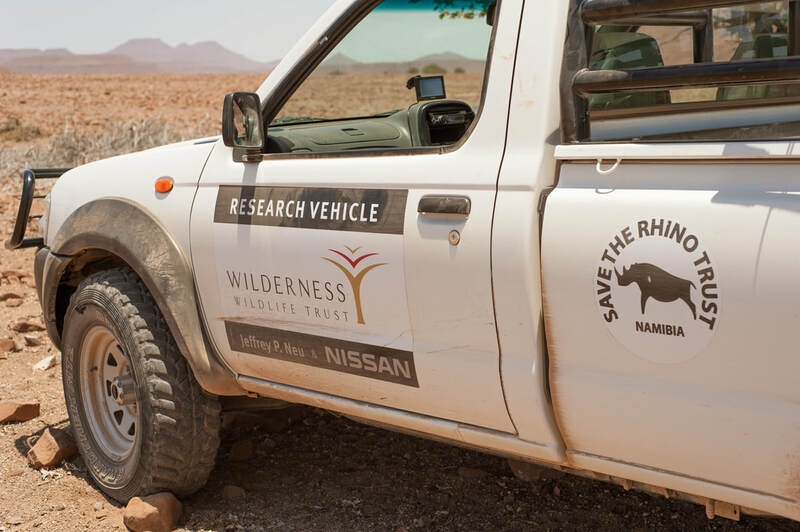 Here at Rhino Camp, people and cars are few and far between. They are truly wild and untrusting. So a sighting here is a special experience. We were then treated to a fantastic lunch at the base of a mountain under a shady tree. 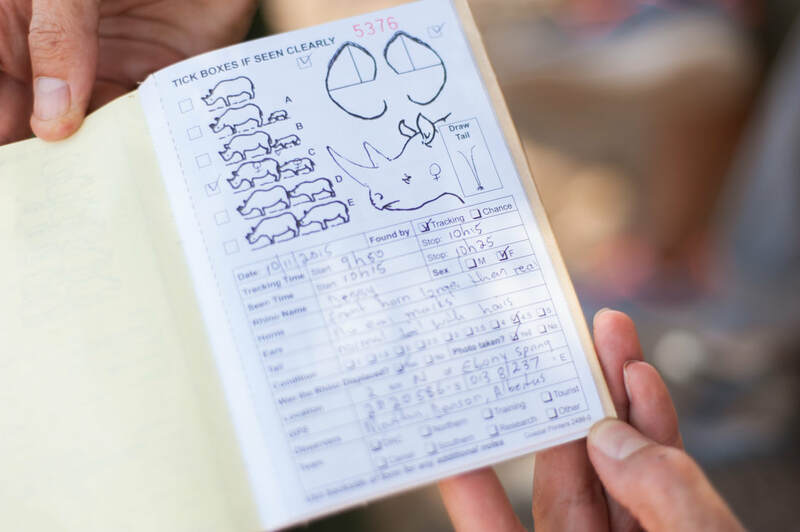 We shared beer and wine and learned fascinating facts of what the trackers do and what they look for on each rhino. 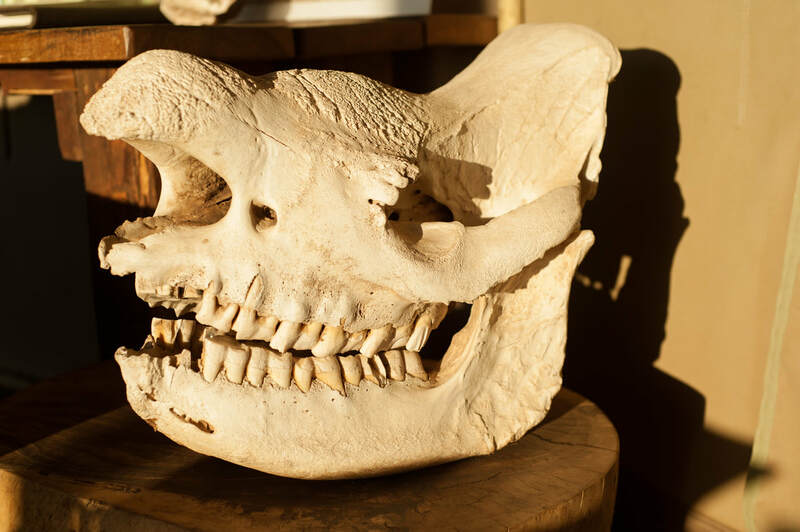 We learned that poachers can get up to 65 thousand US dollars per kilo of rhino horn. This just re-enforces the importance of sustainable eco-tourism and conservation. We got extremely lucky finding our second rhino of the day. Because of our beer and wine at lunch, the boys needed to make an emergency "technical stop" (pee break). 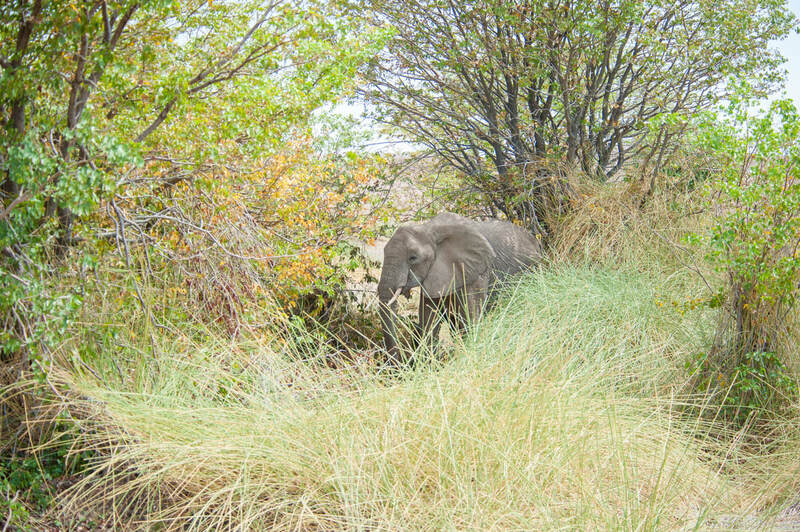 We just so happened to choose a bush for our technical breaks that was next to a bush where we woke a sleeping rhino and had to beat feet back to the jeep. ​Quite a fortuitous pee stop. 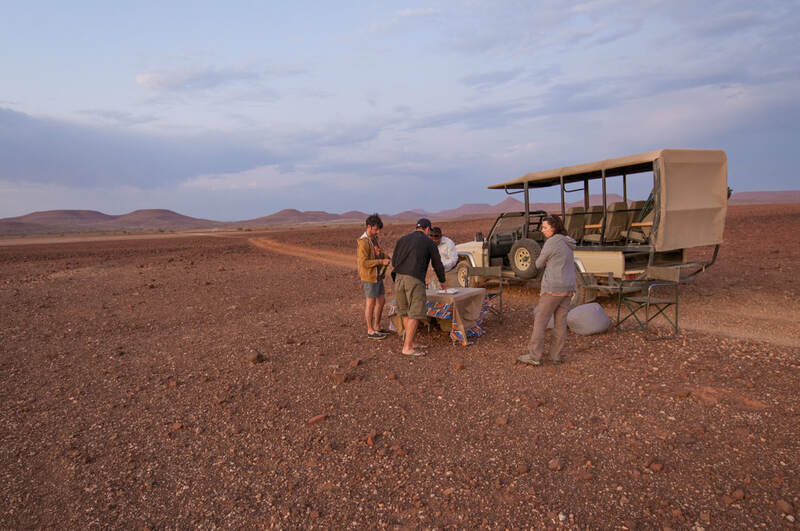 Another gorgeous evening for sundowners in the desert. Leaving Rhino Camp was very bittersweet, but we realize our time here was an amazing once in a lifetime experience. We can't recommend it enough. 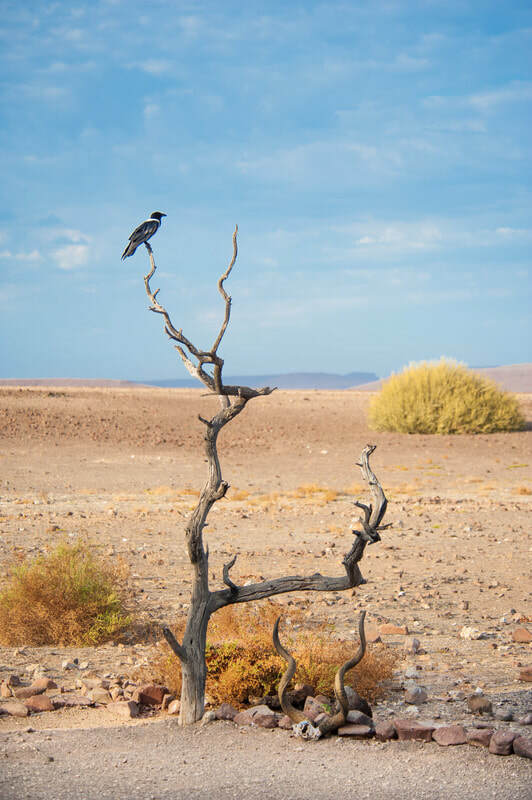 Now onto another very long road trip headed south with an overnight pit stop in Swakopmund in route to Sossusvlei. This is a good 2 days in the car, so settle in and make sure your reader is charged up and you have plenty of snacks and drinks. We got very good at pulling over on the side of the road and having a quick picnic in the middle of nowhere. Also, get ready for driving through clouds of white dust as other cars pass you by. You might as well pull over for a few minutes and let the dust literally settle. 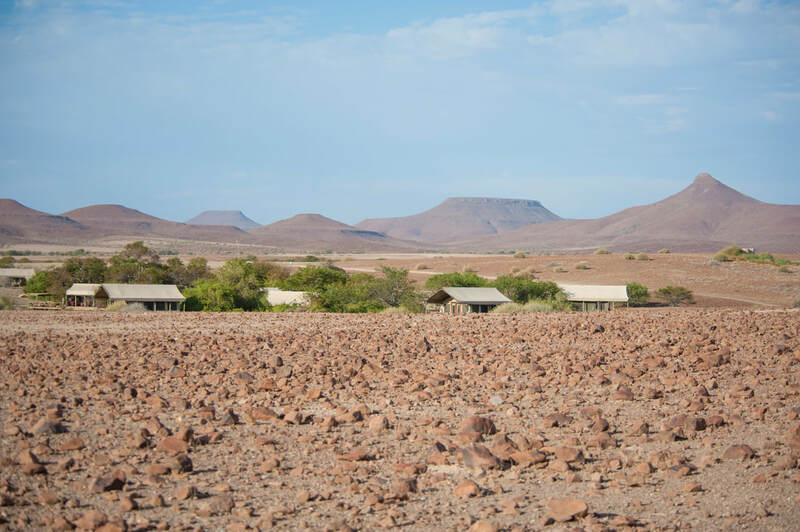 ​To read about our experience in Sossusvlei, click here. 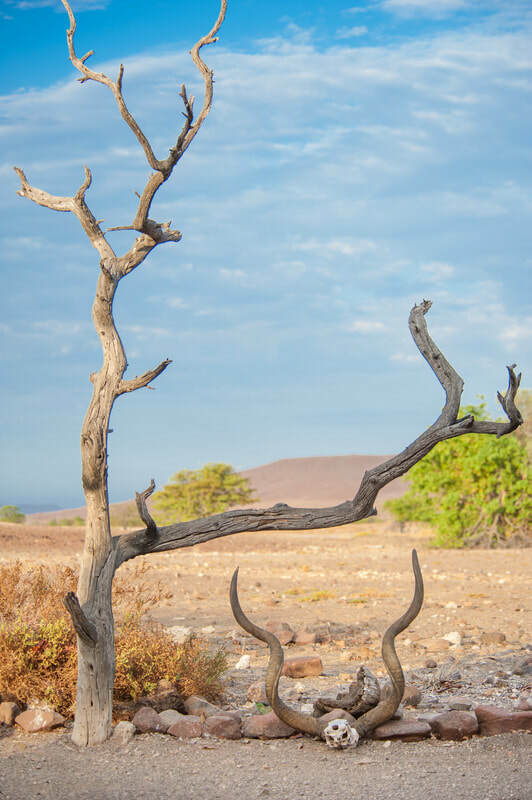 For our self-drive safari in Etosha, click here. 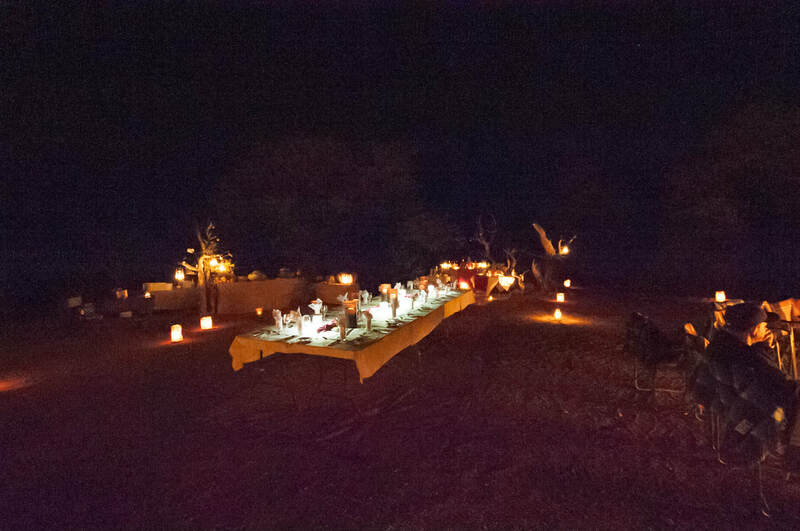 And for our safari in Ongava Game Reserve, click here.